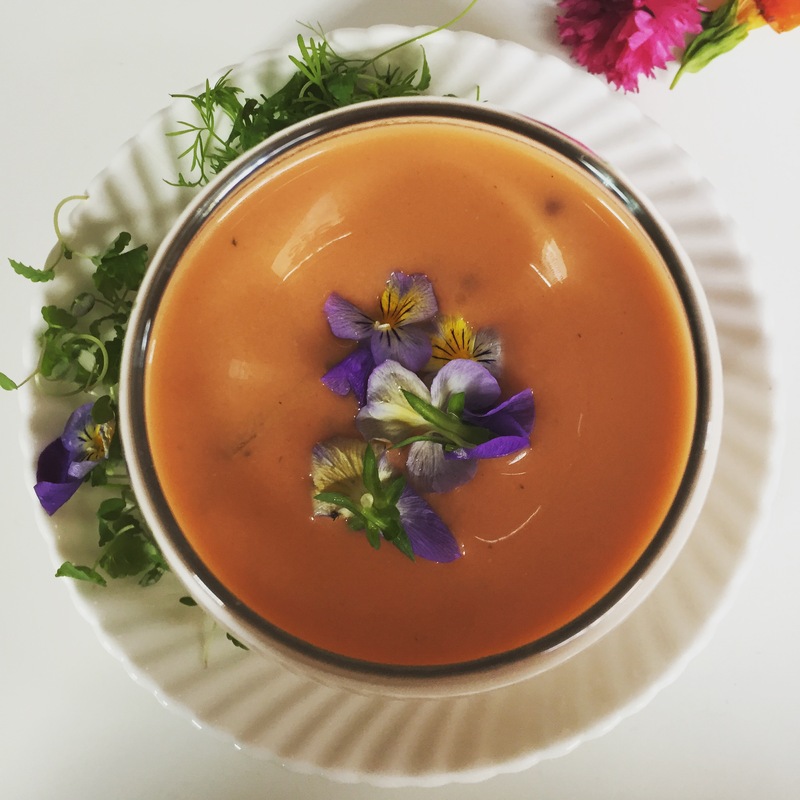 Part of the Summer Mushrooms Seasonal Dinner Parties’ time plan, this cool and smooth gazpacho is a lovely, light starter for any summer’s day. And there are surprises, like the tiny enoki mushrooms and large shavings of infused summer black truffle, as well as mint, making it a bit different to the norm. I’m a bit particular about seasoning, and although I do love sea salt and smoked salt (which I have used here and is great with raw tomatoes), I tend to think things have been over-seasoned, personally. It really is up to the individual how much salt and seasoning you like. 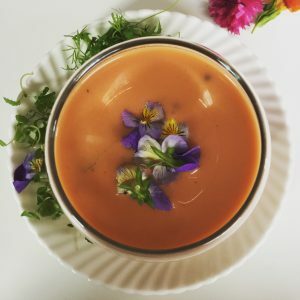 So, I have served this creamy gazpacho with different herbs, salt, peppers and lemon zest, and now your guests can choose to add for themselves! It’s also looks rather pretty. Brush the dirt off the truffle with a firm mushroom brush or pastry brush, the grate roughly around the outside to remove any caked dirt. Take a damp cleam cloth or kitchen roll and wipe the surface. With a madoline or using a sharp knife, slice some very thin slices from the truffle into a small bowl. If you have any large pieces leftover, just grate them. Sprinkle with salt (just half a pinch – this will help bring the flavours out, then add 1 tbps boiling water (a tip I got from an Italian café in Palma). Cling film and pop in the fridge until needed. Slice the tomatoes, reserving some for decoration, cucumbers and garlic, and food process together, mix in the olive oil, sherry, mint and vegetable stock and seasoning, then blend until smooth. Sieve and discard the pulp leftover. Blanch the golden enoki in boiling water for 10 mins. Drain and reserve. 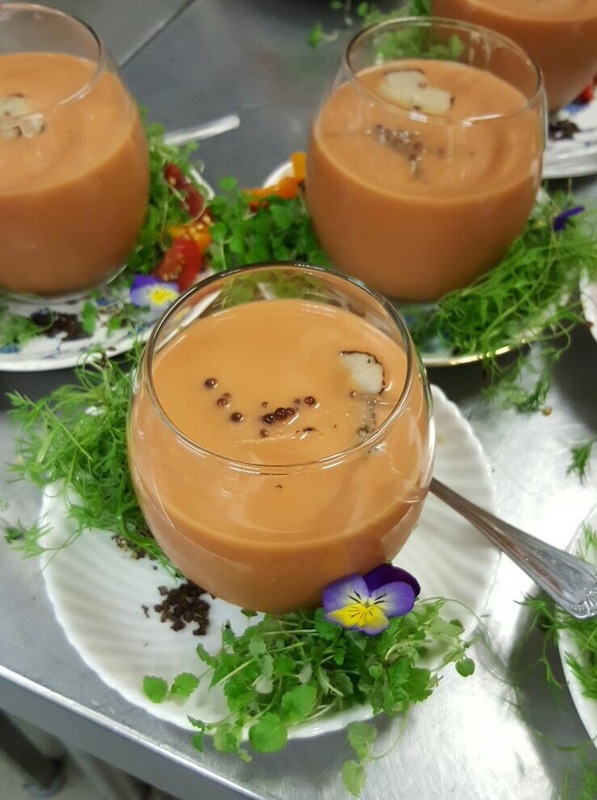 When ready to serve, add the ice to the tomato mixture and liquidise. Stir in the mushrooms. Pour into glasses and dress the glasses with slices of the summer truffles, reserved tomato quarters and edible flowers. Plate each glass on a plate and decorate with dill, lemon balm and more smoked salt on the side.